When it comes to bringing your home to life, nothing beats the refreshing appeal of new PVC-U. It’s a look that lasts a lifetime. By choosing Deceuninck, you don’t just benefit from PVC-U’s natural insulating properties, you’re selecting PVCU designed, developed and engineered to the highest possible standards of quality and performance. By installing our advanced and expertly engineered UPVC, you will enhance your home and increase your comfort while enjoying that all important peace of mind. Each frame offers superb protection from the elements plus thermal insulation that keeps your house warm, dry and draught free. What’s more, their outstanding acoustic insulation will shield your home from the noisy hustle and bustle of the outside world. Also, for your total safety, our windows are compatible with all standard security hardware, while boasting many in-built protection features. Excellent weather performance. 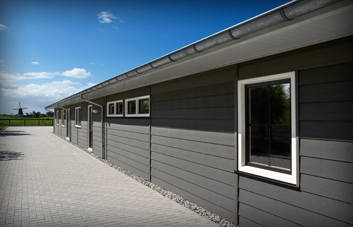 Weather has no effect on PVC-U building materials. Problems like rotting, rust, etc. just don't apply. In special conditions like coastal areas (salt, storm, sun...) the benefits of PVC-U are particularly applicable. Self extinguishing. PVC-U burns when subjected to flame, but does not burn by itself; the product extinguishes immediately when the external flame source is removed. Resistance to most chemical products. The list of chemical products that PVC-U is able to resist is very long indeed and can be obtained on request. Anti-fungal properties. There is no bacteriological development on PVC-U which makes it an ideal material for us within hospitals, food industry, etc. Easy to clean = low maintenance. Its closed, smooth surface means that PVC-U is extremely easy to clean using a gentle household detergent dissolved in water. This also means that the product is virtually dirt resistant because there are no pores which can be filled with dirt. Thermal insulator. Like wood, PVC-U is a good insulator. Its coefficient of heat conductivity is actually slightly lower than wood at 0.17 W/mC°, compared with 0.23 W/mC°. The equivalent coefficient for aluminum is approximately 210 W/mC°. Acoustic insulator. The combination of the PVC-U material, the double-glazed sealed glass unit and the excellent system design, ensure superb acoustic insulation. Easy to work with. Practically any automated or manual processing is possible. Weldable. Its ability to be welded means that this material offers window manufacturers the opportunity to install high productivity automated manufacturing systems: a whole window can be welded together in just a few minutes. The fusion temperature of the weld is approximately 260°C. The sawn joints are heated locally to this temperature. Bondable. Additional plastic components, such as end cap can easily be bonded to PVC-U. All PVCU window and door systems look the same, don’t they?? Deceuninck have a unique system available which combines the quality of a modern Deceuninck extrusion and the looks of a traditional timber frame. We also have Deceuninks full range of chamfered profiles for a more simple frame finish. Replacing windows and doors or the addition of a conservatory remains one of the most popular choices of adding style and value to your home. Choosing our latest decorative designs will enable you to complement the style and look of your home by reproducing the appearance of traditional timber, without the maintenance headaches. Your new frames are guaranteed not to warp, twist, rot or discolour, making your decision a sound investment. In addition to brilliant white you can choose from a range of wood-grain finishes. Alternatively, add a splash of colour to your home with one of our unique Decoroc surface coatings. All of these together the almost endless design options available, make it possible to tailor our products to meet your exact requirements. Choosing our decorative and chamfered frames with their unique sculptured styling ensures your choice of windows will bring elegance to any home. This beauty will not mean compromising performance, so you can be confident of supreme quality and security to match its good looks. Viewed from inside or out, Deceuninck windows will transform the look of your rooms as well as your home as a whole. Illuminating interiors with natural light, providing comfort from the elements and affording security with peace of mind, are the essential criteria for all our window products. These are the standards by which our reputation has been established. Good looks, great performance and long lasting peace of mind. Critics of PVCU have claimed, often rightly, that the character of a property is reduced by the use of modern PVCU system. The introduction of this new decorative system facilitates the production of both more sensitive replacements and more stylish new installations. Deceuninck have also been know for the unique colour of there systems. The Deceuninck brilliant is know throughout the industry for the brightness of the white and standard of the finish on the frame. We do have Deceuninck standard chamfered system available but the unique decorative lines of the 1800 system have proven extremely popular with our customers in recent years. 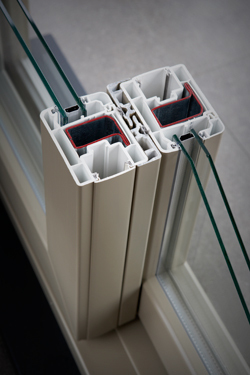 Combined with our low sight line glazing gasket we challenge you to find a more attractive system. Deceuninck quality; We speak from experience; in 2001 we installed a new conservatory in Ilkeston, the property already had a substantial conservatory but the owners wanted a change in colour and style. The existing conservatory was constructed using Deceuninck’s 1200 series system 14 years earlier. When the conservatory was dismantled it was in such good condition it was sold to one of our existing customers who re-fitted the conservatory on his property also in Ilkeston.